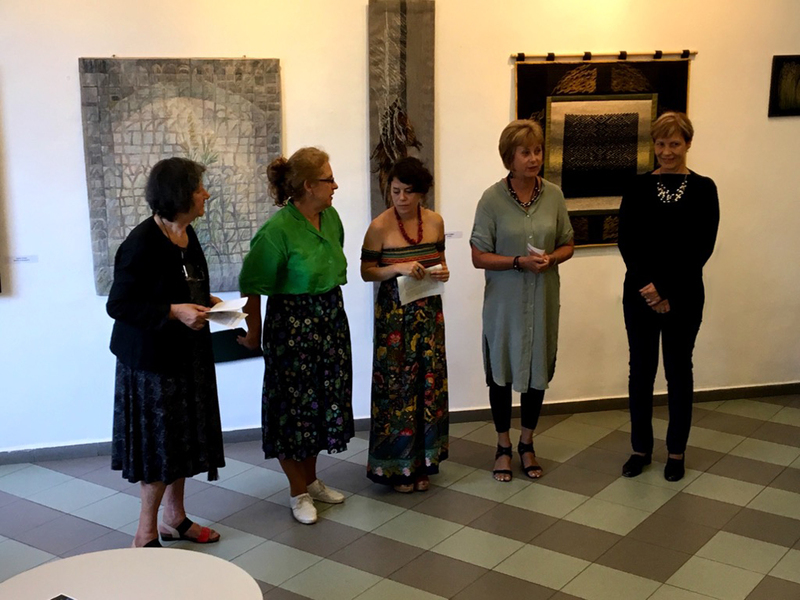 Ladies and Gentlemen, I’d like to welcome you to the Association of Hungarian Tapestry Artists’s group exhibition called Stories in the Threads! The Association of Hungarian Tapestry Artists, with its over 80 members, collects and represents artists of the craft from Hungary to Hungarians beyond the borders. Saying that this dynamic association is one of the most organized art groups today in Hungary cannot be called an overstatement. In this welcoming and warm community members receive inspiration and opportunities to exhibit and take part in community workshops. Proving this is the eight imposing tapestry created in unity by the artists. The artworks of this exhibition represent the artistic and stylistic diversity of the tapestry artists. 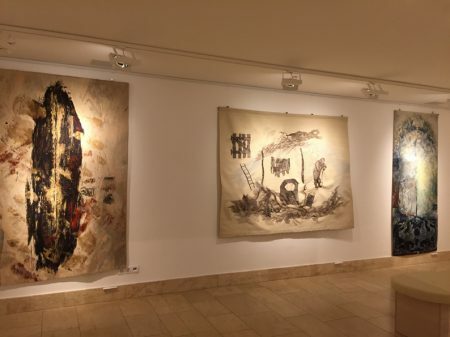 Although 1970 marked an attempt at modernization in the history of Hungarian tapestry, by the mid-1990s, at the time of the association’s foundation, most of the artists have turned back to the traditional tapestry roots. This phenomenon, even if not conscious, it represented a sharp U-turn back to the academic founder of the art form in Hungary. Back, to one of the most important figures of the 20th century Hungarian tapestry art, Noémi Ferenczy and her concepts on medieval ideals. According to her, the real value of the tapestry is the time and dedication to the material and the artist’s handprint. This means that tapestry can be interpreted as the art form of man’s rule over time. Tapestry is basically a protest against the machine civilization that accelerates the passage of time. Processing it allows its creator to “snap out” of time and enter an out-of-time state. While working, the tapestry artist distances him or herself from the everyday life and becomes fully and thoroughly present. Sacrificing time and energy the artist basically sews him or herself into the tapestry. Stories in the Threads: the name of this exhibition also references this meta-narrative that is far from implying a detachment or something abstract. It is more like an intimate connection between the object and the threads of the spirit forming it. To quote Noémi Ferenczy once again, “The artwork grows together with the breathing of its creator, together with the creator’s thoughts and perceptions, face to face, in private (…) it cannot be a separate thing or being for it would not only exclude intensity, it would remove intimacy just the same.”1 This togetherness and the “manifestation” of the threads of soul is what can be viewed on the walls, in front of the audience. Faith, one of the greatest mysteries of the human soul, is, just like the creative process, a truly personal question, one of the key motifs of the showcased tapestry. It may appear conceptually, philosophically or in specific Christian symbolisms such as the alpha and omega sign on Irén Málik’s creation or the Christ-corpus on the work of Ágnes Kecskés. Eleonóra Pasqualetti takes her works as autonomic, spiritual mediums. She mostly deals with the symbolism and archetypes of centralization but from right here, from the visible world with a figural approach. Edith Balogh passes the narrative approach or the portrayal of humans creating an abstract, metaphysical space where the vivid colors of transcendental light takes center stage. Wheat-sheaf reaching towards the light across the cages of human souls is the vision appearing on the work of Erzsébet Katona Szabó. Also as symbolism for soul and destiny plants can be seen on the works of Indira Máder, Hajnalk Ipacs and Noémi Benedek. The love-hymn of Paul the Apostle is recreated in the cosmic landscape composition by Eszter Bényi, Judit Székely references the personal search for God with the motifs of prayer and ladders. Another important group of the figural works is the landscape representations. The temperament and original style of the creator can be measured well in the genre often functioning as a mirror of the soul. The landscape vision by Verona Szabó resembles photographs and maps, while the one by Éva Sipos is more expressive and picturesque. In the third, larger thematic block I’ve listed those works that directly or indirectly connects the human experience or to the perspective of the female narrative. The soul-feather symbolism by Judit Pázmány oe Borjána Maevszka Koncz’s creations are clear representatives of this theme. Lívia Pápai’s work, where she combines the portrait of her son with a Dalí painting into a black and white composition or Katalin Zelenák’s deconstruction of a female portrait delicately illustrates the separation of the present from the renaissance man-ideal. The exhibition is also home to several works connecting to literacy. Éva Penkala and Annamária Kőszegi was inspired by the poem “I cannot know” by Hungarian poet Miklós Radnóti. Bea Bocz commemorates one of the greatest mystics of 20th century Hungarian Christian literature, János Pilinszky while Katalin Fóris have chosen the poem called “The Seventh” by Attila József as title for her installation woven by film negatives. Although in smaller numbers, abstract visual thinking is also represented thanks to the work of Ida Lencsés. The private oeuvre can be interpreted through the context of self mythologies as the works of Zsófia Harmati, Eszter Kneisz and Annamária Orbán. 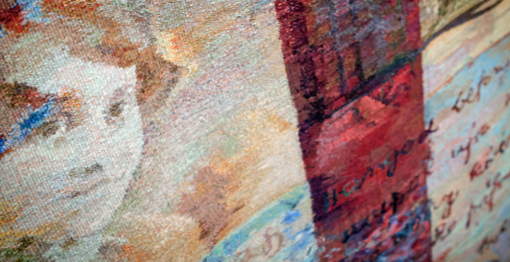 The monumental work created by the Association of Hungarian Tapestry Artists is called the “Colors of Europe”. This title is no coincidence as this strong community can be seen as the guardians of Europe’s former lights, weaving their personal and common destinies with the patience and loyalty of Penelope. 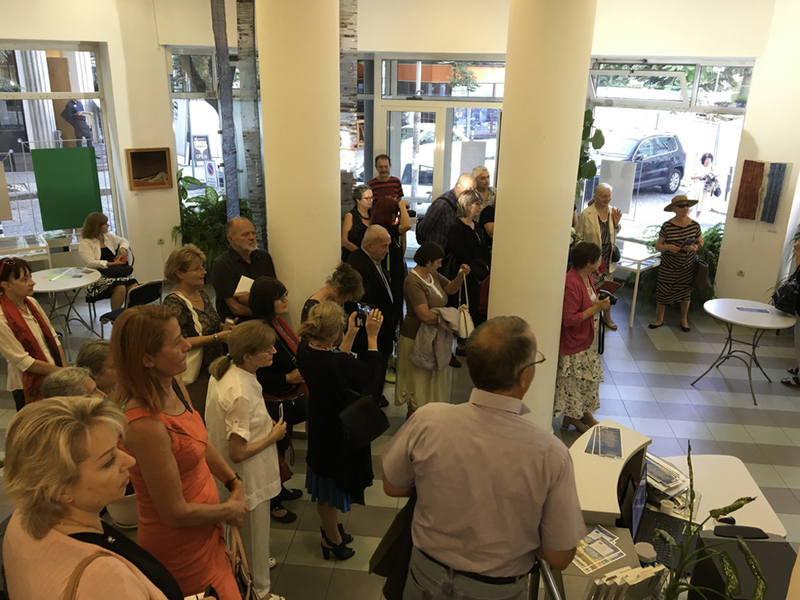 For myself and for the exhibiting artists I wish for this exhibition to contribute to the strengthening of the cultural relationship between Bulgaria and Hungary, towards a mutually-supportive cooperation. Thanking your attention, hereby I’m opening the exhibition. 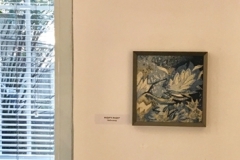 The Association of Hungarian Tapestry Artists was invited to Miniature Textile Exhibition in Croatia by the The Croatian Association of Artists of Applied Arts (ULUPUH). 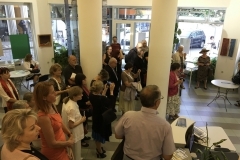 The exhibition at the Balassi Institute in Zagreb opened in April, under curatorship of Nóra Tápai. Minitextiles BALASSI INSTITUTE, ZÁGREB 04.04.2018. Dear Ladies and Gentlemen, Dear Exhibitors! The Hungarian Tapestry Association is here for the second time at the Balassi Institute. Last year we introduced you to a representative exhibition and we are very happy to be here again as a result of the first relationship. This year’s joint exhibition has an exciting message. 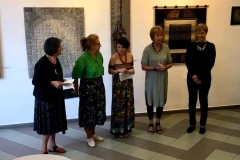 The meeting of Hungarian artists with classical weaving miniature works with the conceptual, experimental textile objects of Croatian artists telling their message about our world today. In Budapest, in April 2017, we organized an international exhibition entitled Kárpit3, which included 35 large-scale works by artists from 17 countries. Members of the association and foreign artists, Golden Gate, have issued 105 pieces of 20×20 centimeters mini textiles as a symbol of co-operation. From this we will present you 32 works. 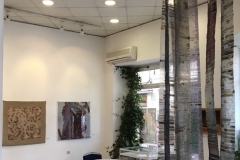 The Hungarian Tapestry Association was founded in 1996 and has expanded to more than eighty members of art organizations, which are considered to be a large number of communities in relation to European practice. It unites and represents the members of our countryliving in Hungary and abroad. 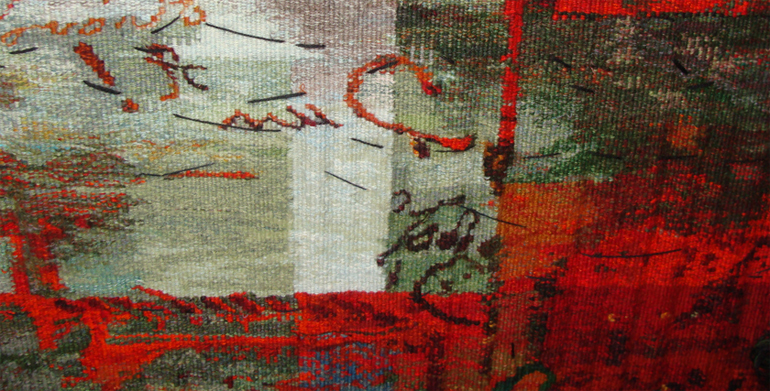 The Hungarian Tapestry Association has been a participant and director of more than a hundred international and domestic exhibitions, most notably exhibitions at the Washington Textile Museum in Geneva, at the United Nations headquarters, then at Vancouver, Canada, and at Ceri on the occasion of the Hungarian Cultural Year. As a significant event, the exhibition titled “Transcendental maps” was presented at the Budapest Museum of Applied Arts, where sixty artists took part in the 15th anniversary of the foundation of the Association. 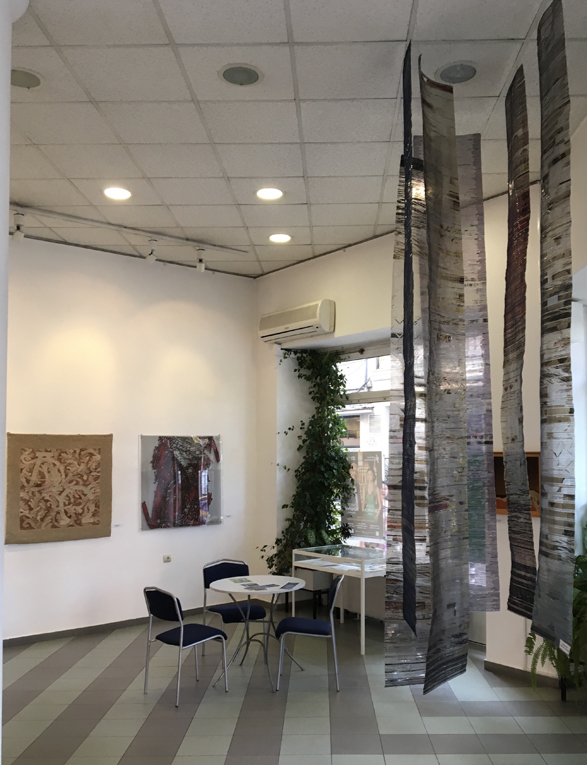 With title ”Weaving Codes” our exhibition at the French Institute in Budapest gathered a wild scale and rich presentation of individual works. 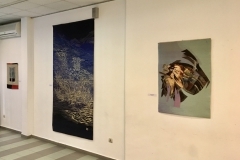 The Association was organizer and host of the Ist and 2nd large-scale international exhibitions entitled Tapestry 1. and Tapestry II at the Budapest Museum of Fine Arts. 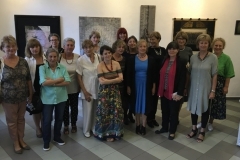 After ten years we have organized a conference for the preparation of the exhibition “Apocalypse or Sustainability” and and the third international Tapestry exhibition was held last year in the Vigadó Gallery. We are proud of our exhibition at the Council of Europe House in Strasbourg and our work by honoring the centenary of the Cultural Palace in Târgu Mureş and the Roman Academy of Hungary when it was 20 years for the association and our artists, that is recognition when the Hungarian Pavilion at Milan Expo more than twenty million could see our joint works. Our unique performance is our eight great works together. 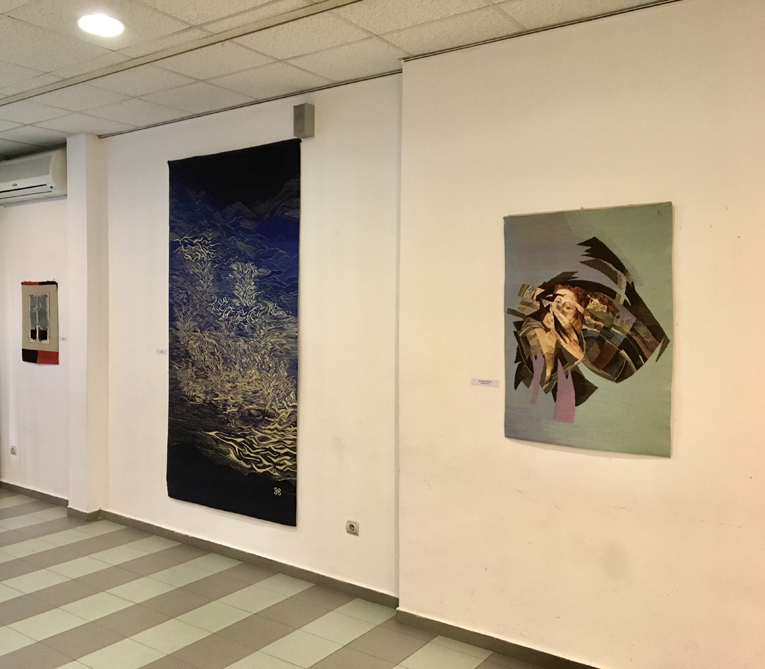 (Tapestry Without Borders, St. Stephen and his Works, Corvin Tapestries, Transcendental Maps, Duna-Limes, Petőfi – “… wrapped my palms …”, Hommage on Radnóti and Szent László triptych. The monumental upholstery creates opportunities for co-creation, the combining of creative self-righteousness and the compassion of working together. The creation of large-scale works was also made possible by the adoption of looms bearing art history value, which also offered a special tradition for the community. Thus, the Association gained a prominent role in the field of university education, with its value-creating activity, which preserved the material heritage of this genre, preserving its values ​​and practice. The genre of traditional tapestry combines designers, making of the carton and weavers’ practice, this practice is cultivated by the association of professional artisans of the genre and representing the possible forums. Similarly, we pay close attention to the issue of mini textiles. Creating mini textiles is a creative challenge, and the small size creates a special situation for the artist. This genre allows us to attempt a sudden idea, whether it is graphic or spatial. With the celebration, we hereby invite the members of the Association of Croatian Artists of Applied Art (ULUPUH) to visit us in Budapest and to look at the construction of our newly built Szent László tapestry and to think together about a new exhibition. Thank you ULUPUH to undertake the works of the joint exhibition catalog and the poster design and production. I express my special thanks to the creation of the exhibition Anna Anna Szlanyinka, a cultural attache and colleagues from the Institute of Balassi, the artists and colleagues of ULUPUH, artists of the Hungarian Tapestry Association, Branka Hlevnjak and Nóra Tápai curators, the directors of the exhibition: Branka Hlevnjak, Tanja Grgurina Vucetic, Eszter Kneisz and Nóra Tápai, Tibor Kovács to the MANK Art Advisor, the patrons of the exhibition and the supporting organizations. 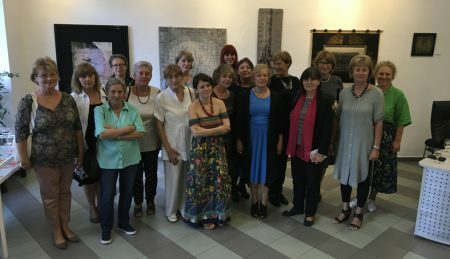 Allow me to introduce the Hungarian exhibitors being present here: Hajnal Baráth, Hajnal Ipacs, Kiss Kati, Máder Indira, Eszter Kneisz, Ida Lencsés, Lívia Pápai, Eleonora Pasqualetti, Éva Sipos, Judit Székelyi, Nóra Tápai, Katalin Zelenák.